For an architect there is rarely a possibility to solve a special task. However, if such a task is also to be realized in a special place, this may be a unique chance in one´s professional life as an architect. We got such a chance in a partnership with office of Van der Valentyn form the peer review process in 1994. The task was to design a Special School of Music for approximately 130 musically gifted children in the context with the late baroque Belvedere palace complex with cavalier houses, orangery and nursery buildings, in the English landscape garden on a hill to the south of the city Weimar. Designing a house for music and musicians inspired us to explore a parallel between music and architecture and develop a construct as a design method for this particular location. From the history we know the experiments of great architects with the music. The attempts of Palladio, Alberti and Serlio to integrate music into architecture are known. For example, Serlio in his `Architecture writing of the consonance of the major third’ derived the proportions of architecture directly from the music to prove the direct relationship between the two disciplines. The multidisciplinary teaching in the Bauhaus allowed some more intensive discussion on the topic in the modernity. As for example Wassiliy Kandinsky tried to order paintings to corresponding tones and sounds of music. The Bauhaus was the last famous institution, where the centuries-old subject of Composition was taught to the architects. Composition is something very distinct for both disciplines and at the same time very connecting. Architect and musician have a plenty of items to bring into relation to each other and help them achieve coexistence. If a musician layers orchestra voices to generate harmony, an architect creates space by the layering of construction elements. This game of the separate elements and their composition brings constantly to new levels and with the assumption that the time in music faces space as architectural equivalent for the scale of continuity, discontinuity, delay and move, crossing and parallelism, we obtain a construct as a design methodology. The main design principle for gymnasium is the composition of functional groups belonging together. Every single layer is developed from the requirements and site specifications. The layers were refined as individual space sequences with regard to previously described parallels. The composition melts individual spatial sequences from every layer in an overall result. In the first floor, where 8 equally big classrooms and library are situated, the theme of parallelism and repeating of the symmetry is visible. Thin window hinges protect introverted classrooms (providing of the daylight is expanded through the sky lights). So the concentration and receptivity of the pupils is increased. The ground floor’s dominant themes are space stretching, rhythm temperament and serenity. The geometric wooden structures, which are cut according to their function (cross for the drawing room, half-circle for the chamber music room, square for the teacher’s room, L-form for the Physics and rectangle for the Chemistry hall), define the space between inside and outside and create an amorphous volume with different insights and outlooks. The basement with the big music hall and practice rooms was pushed out of the existing topography, the gently rising landscape, like a rock pushed inside the hillside not to harm the harmony of the castle proportions. The hall with two contrast functional profiles of gymnasium and concert hall consists of different volumes and individual components, such as the foyer, gallery, arena, forest stage and arcaded walls which unite in a harmonious spatial composition through proportions, materials and placement. Weimar is not only the Motherland of Goethe, Schiller and Liszt, but also the cradle of Modernity, since Walter Gropius founded Bauhaus in Weimar in 1919. 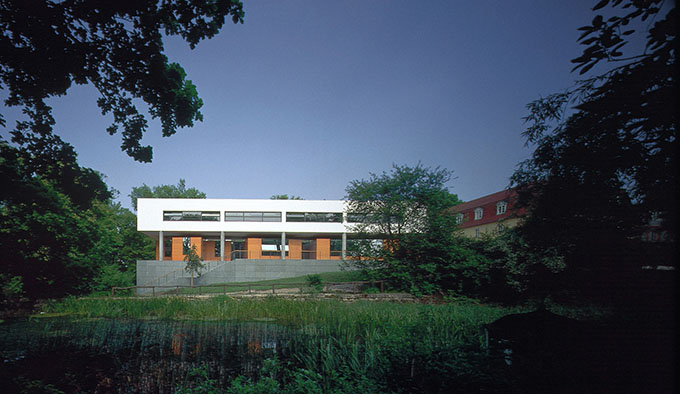 The connection of the project of the Music gymnasium with the Bauhaus and White Modernism does not come down to the superficial aesthetic approaches, instead relating to the foundational multidisciplinary approach of Bauhaus that all the arts influence each other in a positive way. The peculiarity of the project is also that it was completed almost to 100% according to the competition project. The reason for this was that already in the competition level the architectonic concept was proved and refined in close collaboration with structural engineers, acousticians, building physicists, technicians, lighting designers and landscape architects.